Free, though donations are accepted and appreciated in the donation box located in the lobby. Google Map directions to the museum. 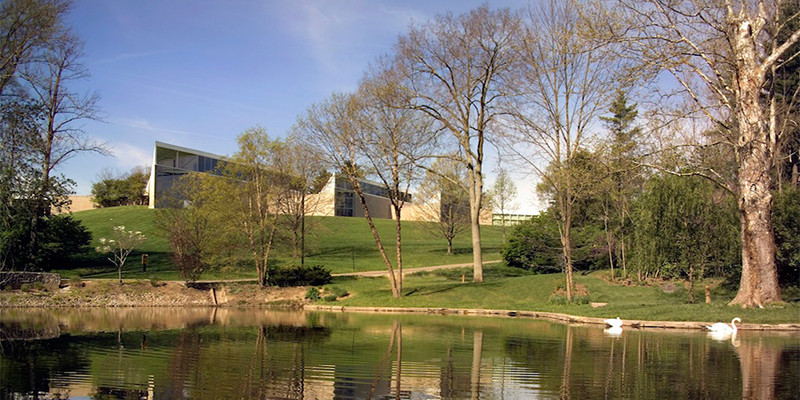 The Museum sits on State Route 27 / Patterson Avenue on the southern edge of Miami University's Oxford campus. Located on the Miami University U3 bus route via Shriver. A campus visitor's permit or a RED Faculty/Staff permit IS REQUIRED to park at the museum. Visitor permits may be obtained at the museum by checking in at the front desk as soon as you arrive at the Art Museum at no cost to guests visiting the museum. PLEASE NOTE per University Policy, students, faculty and staff may not use Visitor Parking Passes. Purses and small bags are permitted in the galleries. Backpacks should be checked at the front desk. *General visitors may upload personal pictures to social media sites, so long as they are not available for someone to purchase or used to market a business. **For professional photography and video shoots, a permission to photograph form must be completed and approved. All museum entries are at street level. A wheelchair is available on request. Individuals who require other accommodations, (e.g., interpreters for the hearing impaired), must contact the university at least 24 hours in advance of the date of their visit in order for Miami University to accommodate their special needs. If you have a special request, please contact the Miami University Student Disability Services at 513.529.1541.